Brandy Carrillo’s first full-time job was unconventional. Most law school graduates begin their careers working for a firm, but Carrillo took a unique opportunity at video game developer THQ. She got to help start its legal department. By the time Carrillo left the company in 2009, she had worked her way up to vice president of business and legal affairs. Carrillo had to forge her own way, not having a significant number of lawyers above her to learn from. But by developing her own way to complete the work, she learned how to be a businessperson’s lawyer. Atari wasn’t saved, but Carrillo came out of the experience having learned how to do more with less. “There was so much work, and there were not enough hours in the day,” Carrillo says. Although overwhelming, the work was invigorating because everyone was working so hard toward the same goal. In 2011, it was apparent to Carrillo that Atari’s financial difficulties would not be solved by a series of deals going through. When another video game company, Japan-based Konami, recruited her to be head of legal for its United Stated division, Carrillo jumped at the opportunity. She was interested in learning the intricacies of a global business and culture as a woman and Hispanic-American in that environment. Carrillo’s experience with Konami was certainly challenging. The most difficult aspect of the job was the three-hour, round-trip commute that kept her away from her children. She also recognized the position didn’t offer the career advancement she was looking for. “While it didn’t turn out to be the career move I had hoped,” she says, she did get some fascinating insights on working for an Asian company. 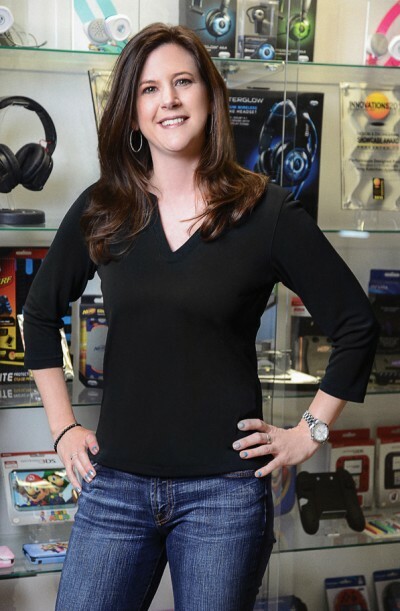 Working for Konami positioned her to land her current job as executive vice president and general counsel at Performance Designed Products (PDP), a video game accessory company. Konami and PDP worked together to create Dance, Dance Revolution’s industrial-grade dance pads to put in physical education classes nationwide. It was a meaningful project that Carrillo was proud of. “When I was working for Konami and negotiating with PDP during the deal, I thought, ‘I want to go work for these guys!’” she remembers.